Yes, most men can benefit from a well-balanced daily multivitamin for nutritional support. The fact is, everybody needs certain nutrients that our bodies can’t produce on its own. A well rounded diet of whole foods is the best way to get the vitamins and minerals your body needs on a daily basis; but the truth is that many American men aren’t able to meet their daily nutritional requirements from their diets alone. In fact, according to the USDA, men between the ages of 31 and 50 would need to eat 350% more dark green vegetables and 150% more fruit every day in order to meet federal dietary guidelines. American men have deficits in nearly every nutritional category (with meat and beans an unsurprising exception). B Vitamins play a vital role in cell metabolism and the formation of red blood cells. They also help your body to use and create energy from the foods you eat. Antioxidant vitamins A, C and E help protect cells by neutralizing harmful free-radicals, which have been shown to disrupt and tear apart vital structures like cell membranes. Antioxidants take away the destructive power of free radicals. Vitamin D is essential for maintaining healthy, strong bones. Some groups of men may be more prone to nutrient deficiency than others. 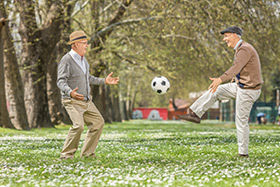 Men over age 50, for example, should obtain recommended intakes of vitamin B12 mainly from fortified foods, dietary supplements or multivitamins, because they could be less able than younger people to absorb the naturally occurring vitamin B12 in food. In addition, vegan men should ensure that their intakes of vitamin B12 from fortified foods or supplements are adequate. Follow the links below to learn more about the multivitamin formulation that’s right for you. While not a substitute for a healthy diet, taking a multivitamin is one of the safest and easiest ways to ensure that you’re getting the required daily vitamins and minerals that your body needs to function properly. Geritol® multivitamin contains every essential vitamin and mineral, including antioxidant vitamins A, C, and E.
Office of Dietary Supplements. Dietary Supplement Fact Sheet: Multivitamin/mineral Supplements. Retrieved from: http://ods.od.nih.gov/factsheets/MVMS-HealthProfessional/ January 18, 2013. Vitamins: Separating Fact From Fiction. Men’s Health. 2005-2013 WebMD. Retrieved from: http://men.webmd.com/features/vitamins-separating-fact-from-fiction January 15, 2013. Vitamin and Mineral Supplements for Men. Men’s Health. 2005-2013 WebMD. Retrieved from: http://men.webmd.com/features/vitamin-mineral-supplements-men January 15, 2013.